Retirement is a time that you are able to do so much more than ever before. Time is by your side and it is up to you to live a full and active life and be happy. What can you do so that you can look forward to each new day eagerly and enthusiastically like a child? 1. Interest: What is your interest? What do you love to do but you have not been able to do until now? Doing something which you are interested to do will be a delightful way to occupy your time. Writing articles on your blog or publishing a book will be a challenging and rewarding thing to do. Writing stimulates your brain and promotes creativity. It exercises your mind. An article well written is a very satisfying experience. Start writing today. 2. Attitude: A positive attitude during your old age is an important mindset. When you think you are young you will be young at heart. Be cheerful, joyful and hopeful to live life happily and freely. 3. Friendship: Do not just mix around with people of the same age group. Join younger people to be influenced positively by their youthfulness and vitality. Feel the vibration of their alertness and energy. 4. Gratitude, appreciation and acceptance: Getting peace of mind is to fill your heart with thankfulness and love. Be appreciative of what you have got out of life. Accept those things that you cannot change and be flexible to make changes which are inevitable. 5. Belief : You may not be working any more but feel good about yourself and maintain your self-image and look at life with a positive perspective. Life is still meaningful when you believe you still can contribute to society. 6. Learning: One critical area of life for baby boomers is not to stop learning. Be curious and inquisitive to explore new things and enrich the mind. Stop watching too much TV to dull your mind. Learning is for growth and self-development and to be young again. 7. Healthcare: Health is the most critical issue for older people. Health is wealth and wealth is health. Be fit and healthy by taking a walk in the park, eating nutritiously and resting sufficiently. 8. Financial freedom: Health and money go hand in hand during a person’s retirement. The point is to have sufficient retirement fund and live within your budget. Another issue is to maintain good health and avoid huge medical expenses. 9. Traveling and sightseeing: With good health and money you can go places and see the world. It’s a marvelous way to observe how other people live their lives. 10. Relocation: Do you think you will gain a better quality of life when you relocate to a smaller town where the cost of living is not so high? There is less pollution and people care more for each other. There is nothing complicated to be healthy and fit. Just follow some simple and natural ways to be healthy. 1. Be careful of what you eat: Health food is fresh and without further processing. When it is processed, sugar, salt and oil are added. These are bad for your health. Steaming is the best way to cook your food and try to avoid frying. Eat less but often to assist metabolism. Eat more vegetables and fruits and drink plenty of water every day. 2. Be physically active: To be in a cheerful mood and possess a clear and calm mind with abundant energy, jog, cycle or swim regularly. When you exercise you increase your heart beats and perspire to promote your stamina. Take the opportunity to walk more and drive less. Your body works better when you move more often. Go outdoors and get under the sun and breathe in fresh air in nature. These are the best things you can do to promote good health. 3. Be clean: Prevention is better than cure. Wash your hands before eating, after visiting the toilet or touching animals. Avoid people suffering from infectious diseases. Maintain cleanliness of the home and avoid clutter to allow positive energy to flow freely. 4. Be cool and calm: Breathe slowly and deeply to be calm. Getting peace of mind is to avoid negative emotions and more material wants. Fill your heart with kindness and gratitude. 5. Be careful of your body: You need 7 to 8 hours of sleep to repair damages done to your body during a stressful day at work. A good night’s sleep restores your energy and maintains your immune system .Take care of your teeth by brushing them in the morning and before you go to bed. It is also important to brush your teeth after every meal. Taking regular breaks while at work is a good habit to regain concentration and clear the clutter in your mind. Avoid bodily injuries by not taking unnecessary risk while on the road or be careful while working with electrical tools. 6. Be happy: Researchers have confirmed that happy people are less likely to get ill. They also enjoy better health and a longer lifespan. 7. Be positive: Change your lifestyle slowly to regain your health. Do one thing at a time. Just wake up a little earlier every day. Feel the positive changes in you to motivate you to develop more healthy habits. Action: You have learnt a lot. You know what to do, but you have not taken the first step. Your first step is the starting point to realize your dreams and goals. Do it now. Don’t wait for the right time. There will never be a better time. Now is the time to do what is right. Achievement: You achieve when you believe what you have conceived can be realized. You will be motivated to take immediate action. Appreciation: You appreciate not only others but yourself. Appreciation is to look for the good in others and yourself. When you value yourself you are resolved to do better than before. Your gratitude towards others will be acknowledged and appreciated. Attitude: Attitude is everything. It is your thinking about things and how you react to events. When your thinking is positive, more often than not, the outcome will be positive as well. Belief: Belief is hopefulness with confidence. Have faith in your ability to do what you need to do with positive results. Challenges: Life is about ongoing challenges when you view problems positively. Meeting, not avoiding, challenges and overcoming them is the most effective way to build confidence. Change: Making changes is to avoid standing still and be progressive. Be flexible and ready to accept changes because change is the only constant in life. Compassion: Doing good is the way to get peace of mind and feel good about it. Be interested in others and find out what you can do for others. Confidence: Confidence is the positive thinking of your outlook in life and your capabilities. It is built upon your past achievements and successes. Be confident, act confidently. Courage: Courage is to try new ideas. It is also to do things differently. To be courageous is also to take risk. Success is having the courage to take risk. Are you captivated and motivated by these words? Solving problems: Solving problems is the best way to exercise your creativity. A new problem needs a new solution. A new solution has to be created. Do it your way: Do not imitate; do things your way to express yourself. It is your style, you way of telling things. It is different from others. Like writing an article, you catch the attention of others when you write it with fresh input and perspective. Attention to details: Doing a job meticulously is to pay attention to each step of your work and discover new ideas and improve upon. Manifest your imagination: The most important thing is to take action to work your ideas. As you go along you can then fine tune it creatively. Change: Change is a necessity. To change is to do things that you have not done before. It is to seek progress and improvement. It is also taking risks. When you do not change you will be swarmed and taken over by changes that are taking place around you. Be proactive rather than reactive. Be productive: To be productive is to be efficient and effective. It means to do things differently in less time but not less thoroughly. Again, you need to be innovative. Read, see and observe: To conceive ideas, you need to read books, articles and look at other people’s ideas and be inspired. You also need to be observant and look at things with an inquisitive and critical mind. A creative mind also implies that you are able to see the usual things differently. Work on it mindfully: Do work with all your heart and soul. Your creative ideas will only surface when you are really interested in doing it. Take a break: A break is only worth while when you work very hard on a problem. It is because a solution will only come all of sudden, say, after a nap. To simplify: To simplify is to do away with the unnecessary. It is to do less and get more done. Life is complicated enough and you should think creatively for a simple way to work and live. Being creative is a positive mental attitude. It is an attitude that opens door to vast opportunities. Do You Know Your Subscribers? Subscribers are the foundation and strong supporters of your site. They voluntarily decide and choose your blog and subscribe to read your articles regularly. The articles that you have written are what they want to consume. They can subscribe to your articles by RSS feeds or by email. Do you know that there are subtle differences between the two types of subscribers? 1. Instant gratification: They read one of your articles and they like it and they subscribe to your feed instantly expecting to read the same substance every day. 2. Unsubscribe instantly: When they read the next article on their feeds and do not find the same subject that they like, they immediately unsubscribe. It is the main reason that your RSS subscribers are like riding a roller coater. It goes up in big numbers in one day and they come down in just as big numbers in the following day. 4. More subscribers: More people choose RSS feeds because they can read everything in one place and you will find that you have more subscribers in this category. Do not be surprised when you find the numbers going up and down drastically. 1. Get to know your site well: They take a good hard look at your site to know more about what you can offer them. They are careful people. 2. Trust: After the survey, when they know it is a site that can be trusted, they will go ahead and subscribe to your articles via emails. 3. Stay with you: When they subscribe to read your articles they stay with you and they don’t go away quickly. Your subscribers increase slowly but surely. 4. Fewer subscribers: Not many people want to share their email addresses, so there are fewer email subscribers as compared to RSS subscribers. I have few subscribers but I have learnt a lot of the psychological make-up of the two types of subscribers. What is your view? It is reported that the average lifespan of Malaysian is about 75 years. When you retire at age 55 there is still 20 years ahead of you to live. What should you do before you retire so that you are financially independent during your golden years? Settle all debts: Settle all your housing loan and car loan and most important of all, your outstanding credit card debts. To be debt free is the way to live a carefree life for senior citizens. Reduce investment risk: Assess your portfolio and rearrange to reduce risks. As a simple example, when previously your investment consist of 60% stocks and shares and 40% fixed income perhaps you should now change to 40% shares and 60% fixed income. Stick to budget: When you retire, there will be no regular sources of employment income except from you own savings and investment. It is important to stick to your budget so that the fund can last you as long as possible. Emergency fund: It is needed more than ever before, especially to cover unexpected emergency medical treatment and related expenses. The amount should be readily available. Cash flow: Determine the amount you require every month and ensure that there will be steady streams of cash to meet your monthly needs. Mental attitude: When you retire from work, you do not retire from life. The key is to live a meaningful life when you stop working. Continue to stimulate your mind by learning new things which you are interested. Blogging is an excellent way to fill your time. You learn about blogging and write articles on your blog every day. Look after your health: When you need insurance the most at old age, insurers stop covering you or if they do, it is going to cost you a bomb. The key is to look after your health to avoid critical illnesses and falls. Are you ready to enjoy your retirement? 1. Goals: Have you put your goals in writing? Goals are your passion and what you want to achieve in life. Goals give you the direction and focus. The desire to get the daily tasks done to achieve your goals is the enthusiasm and motivation in you to welcome every brand new day eagerly. 2. Energy: When there is no energy, there is no spark for enthusiasm. Exercise daily to expand your energy. Eat nutritionally to boost your energy and sleep sufficiently to conserve your energy. Be fit and healthy and be energetic. 3. Be positive: Positive thinking is looking at things with a bright perspective. It means you are hopeful and expect good things to happen and you react to events with an open mind. 4. Be inspired: Be inspired and motivated by the ways of successful people and stimulating stories and articles to keep your enthusiasm stays alive. 5. Good at what you do: You are enthusiastic and happy doing what you want to do because you are good at it and doing better than others. Be creative in what you do to keep up your spirit of enthusiasm. 6. Be interested: There is no enthusiasm when you are not interested. It is important to develop an interest in what you do, especially in your work, so that you can do mindfully and wholeheartedly to produce quality output. 7. Keep score: Enthusiasm is heightened when you see progress in what you do along the way. Review your work from time to time and monitor your performance. When you are making headway you know you are doing the right thing right. In this world it is about instant gratification. Everything that you want you can get it just by a push of a button. Do you think patience is still applicable? Yes, it is. Here are what you can do to develop patience and why it can do wonders for you. Inner strength: The ability to hold your tongue to avoid saying the wrong things is your inner strength. The ability to withhold buying what you want is also your inner strength. Your inner strength is about your patience which is a virtue. Patience is the essence of your well-being and serenity. 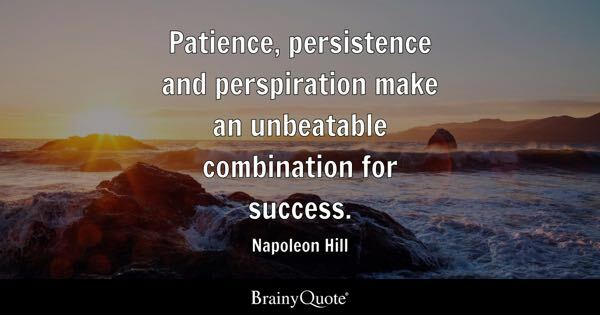 Patience for success: Patience or perseverance is the only way to be excellent and successful. It is because it takes a long time for you to gain the skills and expertise in the field of your endeavor. Are you willing to work diligently for a few years to learn the trade? As an example, a writer can only improve his or her writing skills if he or she continues to write over a long period of time every day. To be good in anything patience is the key. Harmony with nature: Trees grow, flowers bloom and streams flow. In nature, things happen very slowly but surely. You may see a tall and big tree but it takes ages for it to be at its size. Likewise, life is to be taken a step at a time. Do not hurry by, but be mindful of what you do and immerse in it. Every moment well lived will shape a bright future for you like a sturdy tree over time. 4. Better decision: Think carefully and consider all facts before you arrive at a decision. Take your time and do not decide hastily and regret later. Healthy lifestyle: To be patient is to avoid stress and getting angry. The way to do it is to slow down in whatever you do. Be cool, calm and collected and work a little slower and drive a little slower. Do meditation to obtain peace of mind and react to events calmly. Hope: When there is hope, there is patience. Hope is the incentive to carry on living and patience is the willingness to hang on till we get what we want. 7. Something is worth waiting for: Your goals which are achievable lie in the horizon. It takes time for you to get there. You need to do what you have to do every day patiently. Do less: One of the problems to be impatient is that you have too much to do in too short a time. One effective way is to get a shorter to-do list and without having to work back to back and be overwhelmed. What can article writing do for you? I have found that the more you write the more creative you will be in your writing. You can spot writing ideas easily because you are actively looking for them. You can also improve your writing by writing constantly. What can you get out of writing? Expression: Writing is an expression of your inner self. It is your deep thoughts, emotions and feelings and you express it in your own style freely. Creation: Your writing is your own unique creation. You see things from a different perspective and you write it your way. Be innovative and be original. Authority: The more you write about what you are interested in, the better your writing will be. It is not for you to say how good you are, it is for others to evaluate. The more favorable comments you receive, the more authority you will have on the subject that you are writing about. Impart ideas: Write to provide solutions to other people’s problems. Show others the most effective ways to get things done and write to inspire and motivate readers to make changes for the better in their life. Passive income: One good thing about writing, especially on your blog, is that you can receive earnings from AdSense. Ads will be placed on your blog and are relevant to the subject that you are writing about. While you are working or sleeping, you are generating an income. Do what is less important first: Do not waste your time and energy doing unimportant tasks when you are at your peak performance. Do what is important and difficult when you are able to concentrate to perform your best. Never plan ahead: If you don’t spend a little time to plan ahead you are wasting more time doing the wrong things and left out what is important. Get ready a to-do list for the day, schedule tasks according to priorities and get things done accordingly and smoothly. Never delegate: Don’t do it yourself when others can do the job for you, It is the best way to get more done in less time. Do not be afraid to delegate. Trust others to do a job well. Getting interrupted and distracted: Avoid getting disturbed when you need full concentration for a block of time to get things done. Unnecessary meeting: Ty to communicate by other means instead of a meeting. More time can be wasted when the meeting is off topics and out of the agenda. Socializing too much with co-workers: Taking a short break from time to time is good but taking too long a time to chat with co-workers is unproductive. Rushing: It is a bad habit to rush about and get things done. You are more likely to make mistakes and need to do it all over again and waste valuable time. Do not clarify: The worst thing to do when you are in doubt is to do guess work. Get clarification and do it right for the first time. Do not be ashamed to ask. Do not write things down: Every time when you need to remember something it is more effective to write it down like taking a telephone message. Don’t waste your time and try to recall from your memory what the message is all about. Clutter desk: A messy desk disturbs your peace of mind and hinders you from working undistracted. It is also a waste of time looking for things in a pile of paper. Haphazard filing system: Like a clutter desk, a document not properly filed is as good as lost. It is also a waste of time trying in vain to retrieve it. Procrastination: There will never be a better time to do anything, now is the time to do what is right. Do it now and get into the process of doing it. Before you know a job is done and you are happy about it. While waiting do nothing: When you are expected to wait, be prepared to do something useful and the best thing to do is to read and enrich yourself. Do carry a book or a magazine while waiting for your turn to see someone in the office. Over committed: Do not say yes too often too soon. Your time is limited; promise to do what is important when time permits. Do not overwhelm yourself and get into a stressful situation. Credit worthiness: The way you use your credit cards can be proof of your credit worthiness. When you pay promptly every month for the full amount that you have incurred, it is an indication that you are a responsible person who can be trusted to grant credit. The history of your credit card transactions will be a good reference when you apply for a car loan. You will be considered favorably and most likely your loan application will be approved without the need to get a guarantor. Convenient: It is more convenient to use a credit card rather than cash because it is not safe to carry a large sum of money in your pocket. Moreover, every purchase by credit card is documented and you can dispute the transaction if you think it is not in order. Great rewards: Recently, I have got a Timex watch from the bank. I have just redeemed the points accumulated over a period of time for every dollar charged to my card. When you pay cash you cannot get a free watch or any other valuable items. Track your expenses: You can’t ask for a bill every time you buy something. However, there is always a slip when you charge it to your card. Your spending on your cards is an effective way to track and control your expenses. Online transactions: You can’t get things done without a credit card. The other day I have just discovered that I have to pay by credit card online in order to process my son’s application for a student pass in Singapore. Not only that, you can’t do online purchases without a credit card. For needs only: There is one catch here to keep your credit cards. You have to be self-disciplined to spend on your needs only. For every dollar that you have charged, it is to be backed up by the same amount of cash in your bank and ready to pay at the end of the month. The other thing is to keep only two cards, One Visa and one MasterCard. When a transaction for one card is out of order, you still can use the other one. No incentive when you pay by cash: You can’t pay less when you pay by cash. Credit card issuers offer savings in the form of rebates when you shop at certain grocery outlets and petrol stations. The most important thing is not to incur credit card debt by getting what you want. Take advantage of your credit cards and use them wisely. As parents we love our children unconditionally. We support them, we guide and protect them and we set good examples to motivate them. 1. Are you children able to wake up all by themselves or you have to wake them up? 2. Do your children make up the beds every morning? 3. Do your children choosy about food or they just eat what you have prepared for them? 4. Do they help in household chores every day such as doing the washing up? 5. Do you insist that they must go to school except when they are not well? 6. Whenever possible do you allow your children to go to school all by themselves? 7. Do they go to school on time? 8. Are they taking the initiative and help you carry things around? 9. Do they notify you in advance where they are going and with whom and for what purpose. Do they return home at a time that they have promised? 10. Are they polite to all, rich and poor? The more yes answers to the above questions mean they are being brought up the right way. Are You Getting Job Satisfaction?